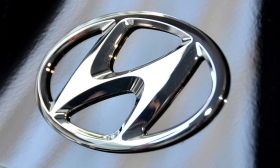 BERLIN/STOCKHOLM (Bloomberg) – South Korean carmaker Hyundai, which is enjoying rising sales in Europe's contracting auto market, is extending its challenge to local carmakers by enlisting soccer stars in an effort to lure customers away from regional brands. The carmaker is attracting Europeans by stepping up sponsorship of their favorite pastime, hiring soccer heroes like Germany's Lukas Podolski and France's Karim Benzema to promote Hyundai as part of a marketing blitz focused around the European championship, the region's biggest tournament. The automaker hopes the marketing move will help it connect with consumers in the region. "One of the issues we face as a brand in Europe is that we're considered Asian and people don't feel emotionally attached," Mark Hall, head of marketing for Hyundai in Europe, said in an interview. "Anything that connects with the region's passions helps close that gap." Hyundai and affiliate Kia are intensifying their targeting of European consumers to extend their expansion, which has been based on a mix of low prices, long warranties and inexpensive manufacturing. That combination has made the Korean manufacturer the only volume carmaker to grow in the region this year, at the expense of local brands, according to data from auto industry lobby ACEA. Hyundai's sales rose 9.8 percent through May, while Kia jumped 24.6 percent in the same period. This compared with a 16.6 percent drop by Fiat Group and falls for French manufacturers PSA/Peugeot-Citroen and Renault of 14.9 percent and 19.4 percent respectively. General Motors' European sales, including the unprofitable Opel brand, declined 11.2 percent, while Ford fell 8.2 percent. Sales at Volkswagen, the region's biggest carmaker, slipped 1.9 percent. "They're benefiting from lower costs, and their cars have clearly improved in quality and technology," said Tim Schuldt, a Frankfurt-based analyst at Equinet. "The French, Opel and Ford are challenged by them the most. Now Kia and Hyundai must manage their growth, which has been a problem for many companies that expand fast." Hyundai plans to increase European sales by about 25 percent to 500,000 cars by 2013, boosted by the ix35 crossover and i30 hatchback. To underpin its goal of lifting its European market share to 5 percent from a target of 3.5 percent this year, the brand will double capacity at a factory in Turkey to 200,000 vehicles, investing 475 million euros ($598 million) to add the i10 subcompact there by the end of next year. Kia intends to lift its share of the European market to 3 percent next year from 2.5 percent now. The carmaker added a third shift and about 1,000 workers in the first quarter to its plant in Slovakia. The expansion contrasts with GM's plans to close an Opel factory in Germany after Fiat shut an Italian plant at the end of last year. Overcapacity in Europe is projected to more than double to about 2 million vehicles in 2012, with demand forecast to drop for the fifth consecutive year. Kia has revamped the Cee'd compact, giving it sportier European styling to challenge Volkswagen's best-selling Golf. The automaker is basing much of its growth on the revamped Cee'd, which is narrower, lower and 5 centimeters (2 inches) longer than its predecessor, to lure customers away from models like the Opel Astra, Renault Megane and Peugeot 308, according to Paul Philpott, Kia Europe's chief operating officer. The model starts at 13,990 euros, 18 percent less than the VW Golf. "It's a car designed for Europe, built for Europe, by Europeans," Philpott said in an interview. "It's got a very European feel to it." Early signs have been promising. When the Svenska Bil car dealership in Stockholm presented the model a month ago, customers were lining up for a test drive. "Kia is where the Japanese were in the 1990s," said Hakan Pohl, head of the dealership that sells Citroen, Mitsubishi, Nissan, Opel and Chevrolet vehicles. "They have a successful road ahead of them." Hyundai is looking for broad exposure with the European soccer championship, which ends with the final in Kiev on July 1. In addition to television and stadium ads, activities at the tournament, which was viewed by more than 4.8 billion people when it was last played in 2008, include public viewing venues in Paris, Madrid, Moscow and Prague. In Berlin, a blue i30 compact and green Veloster sports car flank a giant screen in front of Brandenburg Gate. Since the tournament began June 8, nearly 800,000 people had visited the Hyundai-sponsored fan park as of June 17, when Podolski helped Germany advance to the quarterfinals by scoring a goal against Denmark. The German forward, who appears in ads for the brand and was provided with an ix35 to drive, is among five players, including Spanish goalkeeper Iker Casillas, enlisted to promote the Korean carmaker during the tournament. Hyundai hopes the connection with players leads to a favorable association with fans and car buyers in Europe and elsewhere. "Hyundai recognizes that they have to be strong in Europe," said marketing chief Hall. "Success in Europe adds a huge dose of credibility to other markets around the world."